The automobile accident that claimed the life of high school senior Alex Brown in 2009 also redirected the lives of her parents who have devoted themselves since then to warning others about the dangers of texting while driving. The Brown family from Wellman, Texas, formed the Alex Brown Foundation to fund their public service work. They recently visited OCCC to speak about the dangers of texting and driving. Parents Johnny Mac and Jeanne Brown, along with their daughter Katrina, spoke on campus March 26 about how they lost their beloved Alex, who was texting on her mobile phone just before the single-vehicle accident that took her life. Mother Jeanne Brown, 45, left her teaching job to become president of the foundation. She directed her focus in the speech to young people who text and drive, warning them of the consequences. “We’re here because we want you to understand,” Jeanne Brown said. In her speech, Mrs. Brown talked about the tragic reality of texting and driving. Since Alex’s death on Dec. 29, 2009, the family have been traveling across the nation talking to students about the dangers of texting and driving. The father said their goal is to help other families avoid the grief they have suffered. “The only reason why I do this is because I know how it feels, and I don’t want this to happen to your family,” Johnny Mac Brown said. Mr. Brown quit his job as well to become the vice president of the foundation. In his speech, Mr. Brown said that using a cell phone behind the wheel is a choice, and for every choice made there are two possible results: a good one or a bad one. “Are you willing to trade your life for a text message or a phone call?” Mr. Brown asked. 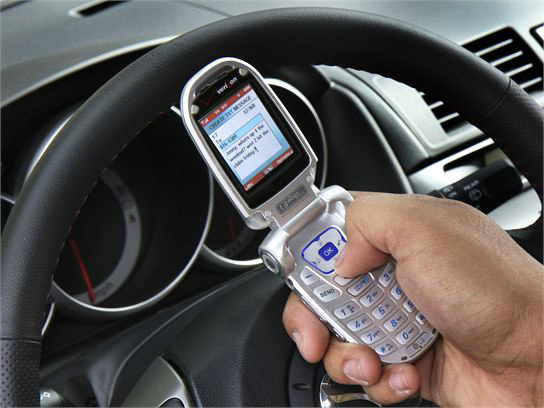 The chances of getting into a wreck while texting behind the wheel are two times higher than drinking and driving. As Katrina Brown, the youngest daughter, started talking about the death of her sister, it was obvious that the traumatic impact of the accident is still ingrained in the parents’ memory. Mr. Brown had his mournful eyes fixed upon the ground while his wife started crying. Mrs. Brown concluded the speech by presenting some helpful tools to eliminate cell phones as a driving distraction and help young students focus on road. Mrs. Brown suggested that people should download applications that are designed to intercept text messages while driving. These applications, such as Text Toggle, are designed to respond immediately to the sender with a personalized message and are available free online. Mrs. Brown also advised teenagers to engage in safe driving programs such as Teens in The Driving Seat. She said the goal of these programs is to raise awareness of the driving dangers and prevent accidents involving young drivers. More than 60 people who attended the presentation signed a pledge not to text and drive. The family said that their purpose is to keep speaking about their cause as long as it takes. To contact Soufain Faiz, email onlineeditor@occc.edu.